Our managed processes from estimating, through to repairs and final delivery, reduces cycle times and gets you back on the road sooner with an incomparable attention to quality and detail. Our caravan accident repairs carry an industry leading 7-year warranty. We undertake all accident and damage repairs and can assist in lodging insurance claims. Whether damage has been caused by an unfortunate encounter with a low tree or a gate that wasn’t there last time you checked in the mirrors or a major impact from colliding with a car, you can rest assured that we will have it as good as new. All construction types including timber and aluminium framed vans, fibreglass or fully composite panels are part and parcel of what we do. Storm damage is not uncommon and can result from a hail storm such as Adelaide experienced in 2016 or simply a gust of wind that decides to relocate your awning. Both scenarios quite often sustain a lot more damage than might initially be apparent. This is why you need a repairer who you can trust to effectively determine the correct course of action at the start. We also undertake specialist work such as repairing accident damaged chassis and drawbars, as well as suspension repairs. We liaise with you throughout the repair process and invite you to see the job in progress or will keep you informed through regular photo updates. Our longstanding and established relationships with insurance companies mean that we are already ahead of the game when it comes to lodging a claim and facilitating an assessment. 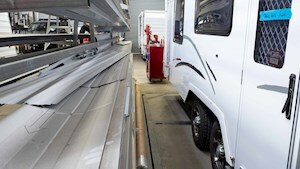 There are two main causes of caravan chassis damage – impact damage such as jack knifing or failure of the components. We fabricate and replace all necessary parts in-house. In some cases, particularly off-road designs, we have found the manufacturer’s caravan suspension to be inadequate for those heavy terrains. This leads to failure which can in turn cause damage to the caravan chassis or body of the caravan. 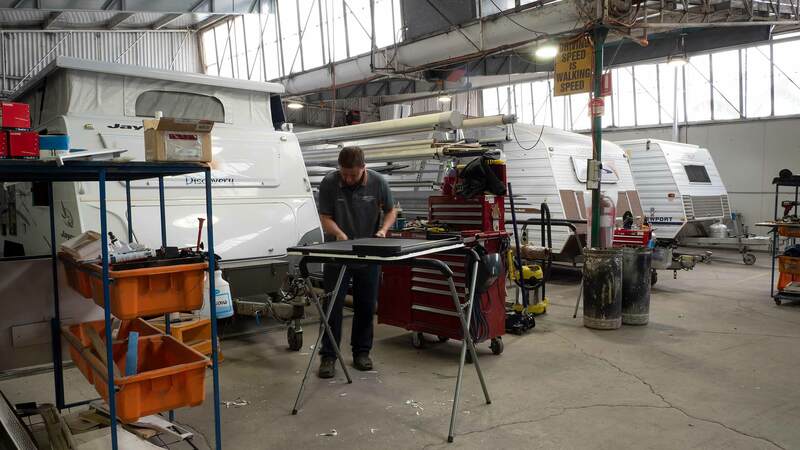 We recently had the misfortune to have our boat trailer part company with the towbar and the front of the boat making quite an impression on the rear of our new slide on Trayon camper. Walker Crash completed the job to an excellent standard with great customer service. Not having worked on this slide on before they liaised with the manufacturer to ensure a smooth job. Highly recommended. Just picked up my Ford Territory today and have to thank you for the attention to detail on its repair. A year ago you repaired our hail damaged caravan which was an excellent and better than new job done on that too. Many thanks for your high standard. John I would like to thank you and your team for the excellent repair work to my caravan, and for those extra repairs you performed which you did not have to. I am one very happy caravan owner. I approach crash repairers cautiously. What a surprise! John and his team were excellent. Always kept me informed. No surprises. Top outcome. Thanks guys. Thank you John for the excellent customer service. Very efficient and timely repair to our Jayco caravan awning. 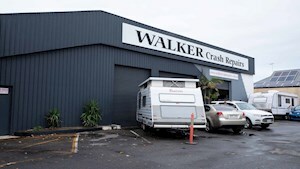 Highly recommend Walker Crash for any repairs to your caravan. Email us with your details in the form below. Fill out the form with your vehicle make, model and a brief description of the damage. Attach photos of the repair work you would like done using the “choose files” button.